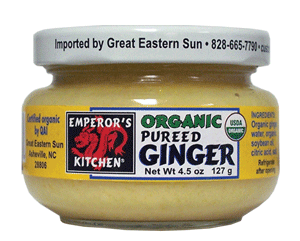 Emperor’s Kitchen Organic Pureed Ginger has a creamy texture and is terrific in sauces, dips, salad dressings, baked goods (ginger cookies, cakes, pies, scones, muffins and puddings), drinks, stir-fries, sautés, marinades. Climb on board the most important trend in home prepared meals in today’s America – Semi-Homemade! Bring home cooked meals to the table quickly and easily with these great time savers. 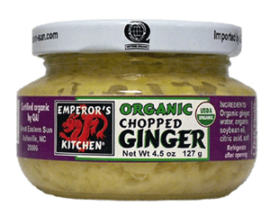 Use Emperor’s Kitchen jarred Organic Ginger products to make delicious stress-free meals that give you convenience without sacrificing quality. 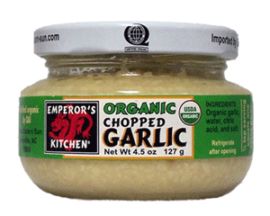 You get fresh, good-for-you instant flavor with no fuss, no mess, no odors, and no clean-up – just add to your favorite dishes right out of the jar! Follow the lead of Sandra Lee and other popular TV Food Network hit chefs such as Rachael Ray & Robin Miller whose techniques combine fresh ingredients with selected store-bought items out of your pantry. The result is mouthwatering meals and desserts, prepared in minutes, that taste like they were made from scratch. 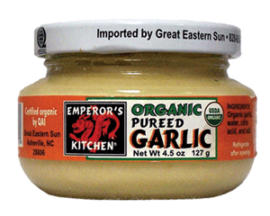 INGREDIENTS: Organic ginger, water, citric acid, and salt.